While programs from Britain, Austria, and Armenia have long been available to buyers across Europe and around the world as reliable bullion options, new coin options are emerging as time passes. There’s a brand-new coin series garnering increased attention on the European continent right now, and it doesn’t come from one the countries you might expect. 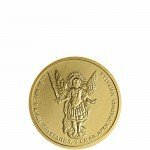 The National Bank of Ukraine is catching the eye of both investors and collectors with the new Ukrainian Archangel Michael series of silver and gold coins. The products debuted in 2011, and have quickly expanded in size and increased in diversity as more numismatists discover this relative newcomer in the marketplace. Silver.com is proud to offer both the silver and gold versions of the coin, and below you’ll find an in-depth profile on the Gold Ukrainian Coins in this collection along with a snippet of information on the silver option as well. All Gold Ukrainian Coins from the Archangel Michael collection are produced by the National Bank of Ukraine, which has the dual role of producing the nation’s currency and implementing its monetary policy, as well as striking bullion coins for investment purposes. Located in the national capital city of Kiev, the National Bank of Ukraine was formed in 1992 following the fall and separate of the states within the Soviet Union. Originally serving as a central bank for the region during Soviet occupation, the bank today serves the independent Ukrainian government in the production of paper currency and coinage for circulation, as well as commemorative precious metals. The Gold Ukrainian Coins in the Archangel Michael series launched in 2011 with very limited issues of a 1 oz Silver Ukrainian Archangel Michael Coin, as well as a 1 oz Gold Ukrainian Archangel Michael Coin and ¼ oz Gold Ukrainian Archangel Michael Coin. Mintage of these Gold Ukrainian Coins has never surpassed 10,000 coins in any one year for any given weight individually. Collectively, the gold coins have surpassed 20,000 coins in total in recent years, but individual coins are often priced at a point such that most investors cannot afford the coins and the mintage figures remain quite low as a result of low demand. 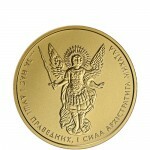 Gold Ukrainian Archangel Michael coin production expanded immediately in 2012 with the addition of a ½ oz coin and 1/10 oz coin to the gold program. 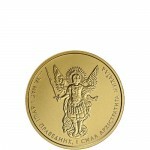 During each subsequent year of production, the 1/10 oz Gold Ukrainian Archangel Michael Coin has been the top seller individually among the gold coins, surpassed only once by the 1 oz coin in 2014. In recent years, the ¼ oz gold coin has gained traction as well as a popular option among investors. The Gold Ukrainian Coins in the Archangel Michael collection share the same features on both the obverse and reverse side with their silver counterpart. In this way, the coins are similar to the Silver American Eagle series or those coins from the Perth Mint’s Lunar Series II collection. Michael is depicted in various reliefs throughout human culture. However, there is one portrayal of the Archangel Michael that seems to be pervasive throughout humanity. The most popularly used depiction shows Michael in a full suit of Roman armor and wielding a flaming sword in his right hand. His figure is often surrounded by a pair of bird-like wings that emanate from his back and the rays of the sun expanding from the background behind his relief. 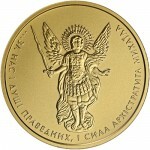 For the Gold Ukrainian Archangel Michael Coin, the image of Michael employs another common design feature of his image, that of Michael standing above a dragon with his sword at hand ready to slay the beast. On the reverse of all Gold Ukrainian Archangel Michael coins you’ll find the coat of arms of Ukraine in the center of the design field. It is surrounded by engravings that are all in the native Cyrillic language, with “National Bank of Ukraine” located above the design set and outside of the octagonal cartouche that frames the coat of arms. Michael’s effigy used on the coin’s obverse face was designed by Volodymyr Taran, Oleksandr Kharuk, and Serhii Kharuk, with engraving of the design features onto the coin completed by Roman Chaikovskyi and Sviatoslav Ivanenko. The Gold Ukrainian Coins in the Gold Ukrainian Archangel collection represent the majority of the collection in this series, but the 1 oz Silver Ukrainian Archangel Michael coin was part of the debut year and is the most popular coin in the collection by individual sale. The 1 oz silver coins contain .9999 pure silver and feature a face value of 1 (UAH). Although it had a low mintage of 10,000 coins in 2011, the Silver Ukrainian Archangel Michael has surpassed 20,000 coins in each of the last three mintage years and often outsells all of its gold counterparts combined. Silver.com makes it easy for you to complete the purchase of your Gold Ukrainian Coins. We accept a variety of payment methods for your gold and silver products, including credit/debit cards, bank wire and PayPal transfers, and paper checks. We accept Visa and MasterCard credit/debit cards, with a one business day processing time. Paper checks are eligible for a 4% discount and take up to six business days to process. Bank wire and PayPal transfers process immediately, releasing your products to our shipping queue for faster fulfillment. Silver.com offers a sliding scale for shipping fees. Depending upon the total purchase price of your Gold Ukrainian Coins, you’ll find an affordable shipping fee available courtesy of the United States Postal Service or UPS. These fees are for standard shipping schedules, and extra fees would apply for expedited shipping. All purchases in excess of $3,000 qualify for free shipping and insurance. If your products are damaged, lost, or stolen during shipping, Silver.com will work with the carriers to locate your packages. In the even this is not possible, we’ll file an insurance claim on your behalf to assist you in securing a refund of your purchase price. 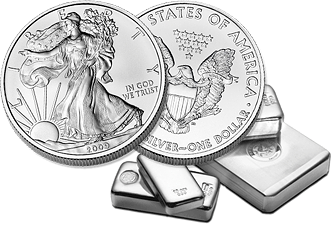 Silver.com wants you to be confident in your investment in precious metal products available from our company. If you have any questions, please feel free to reach out to us at 888-989-7223, connect with us online using our live web chat service, or send us an email with your questions.